Everything has its place in this minimalist kitchen by Insignia Kitchen & Bath, in Barrington. Note the use of “garage” style cabinet doors that swing down to hide appliances on the far wall. The deep drawers beneath the countertop add more space and make large items more accessible. Let’s be honest for a minute: Our kitchen is never as tidy and organized as we wish it was. Life happens. The mail gets thrown on the counter, dishes get left in the sink, and when the kids come home a torrent of stuff and crumbs spews forth. What if there was a way to achieve some balance in the kitchen, such that everything has its place – even amidst the chaos of our lives? An organized, streamlined kitchen is no pipe dream. It’s actually one of the most visible trends in kitchen and bathroom design. No matter if your style is sleek contemporary, decorative traditional or the in between transitional, it is possible to tame your wild kitchen. Minimalism can take many forms in the kitchen and bathroom, but to designer Kate Mikelsons, of McDowell Remodeling, color is the best starting place. She’s partial to neutral beige and gray colors in cabinetry and walls because those colors tend to make a room feel larger and cleaner, without being too busy or too loud. It is possible for a white or gray kitchen to feel too clean, and that’s why color and warmth provide essential accents. Dave Wegner and Megan Lebar, designers for Blue Ribbon Millwork, in Woodstock, added warmth to a new showroom display by pairing a sage green wall with white cabinets, accented with a soft black glaze. They introduced additional textures through a light-gray matte-finish quartz countertop and a wood-like luxury vinyl floor tile. Color isn’t the only place to catch a minimal look. 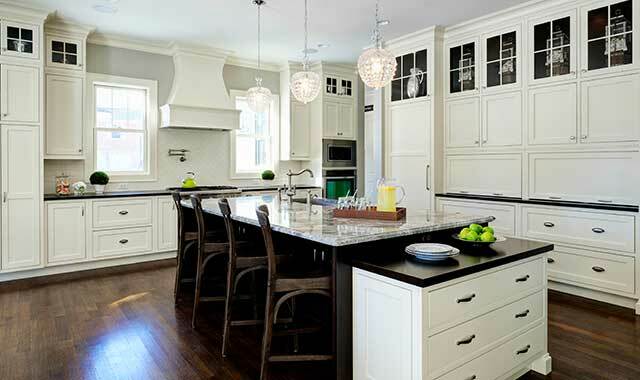 Plain, Shaker-style cabinetry is the most desired look in many traditional and transitional-style kitchens. Loved for its simplicity, Shaker doors are best recognized for a plain frame and a recessed center panel. You’ll often find them matched with a plain, vertical crown molding – no curves, no inset, no angles. When you’re streamlining your kitchen, the focus is less on aesthetics than on function – and there are many tricks to maximize every inch of your room. Stroll through the showroom of Insignia Kitchen & Bath, in Barrington, and you’ll catch just a glimpse of what’s possible. Open a lever on one cabinet to discover a hidden refrigerator. Peek beneath an overhead cabinet to find LED lighting, a paper towel rack and several banks of electrical outlets. Microwaves and trash cans are hidden in drawers; racks pull out from deep inside corner cabinets and TVs arise from beneath the countertop. Wardlow’s colleague, Jennifer Boznos, recently built a special cabinet with a rollout drawer so a client could store work bags out of sight. “All he has to do now is plop the bag onto the tray, close the door, and he knows where it is at all times,” Boznos says. Homeowners around Woodstock are looking for ways to hide as much as possible. Wegner is frequently using pocket doors to hide coffeemakers and televisions. Clients are shunning the long tradition of putting microwaves above the stove, instead opting for a metal hood and a microwave drawer, which can act as both a microwave and a warming drawer. Rollout drawers are being swapped with deep drawers that can hold pots, pans or Tupperware with ease. Wegner is also fond of the new 15-inch-deep wall cabinets – a deeper cabinet that maximizes overhead storage. If drawers and cabinets alone can’t store everything, Blue Ribbon often specifies pieces from Rev-a-Shelf, a Louisville manufacturer of storage solutions for cabinetry. The company makes a wide variety of inserts and accessories, from door storage and appliance lifts to trash/recycling pullouts, organizers and drawer baskets. McDowell Remodeling finds many clients rejecting their microwaves altogether in favor of a steam oven. Designed to act like a microwave, steam ovens are available in drawer form from dealers like Sub-Zero/Wolf. McDowell is an authorized dealer. Technology is integrating itself further into the kitchen, with faucets that turn on automatically and appliances that send alerts to smartphones. The new Lutron switch goes further. Planning for Lutron switches and highly organized kitchens is no small task. Every detail must be thought out carefully in advance. Most designers will tell you the design process takes longer on a minimalist kitchen, but the results are well worth it. McDowell advises slowing things down during the design stage, to ensure that everything is accounted for. Be prepared for lots of probing questions, including those about your budget. Your designer wants to get it right the first time. How you use your kitchen will affect where things go. Wardlow and Boznos, of Insignia, start their plans with a battery of questions, each designed to tap into the client’s lifestyle. They’ll ask what the client wants to hide and why they want to hide it, how the kitchen is currently used, who’s using it, and how their needs might change over time. “We will actually work in their kitchen and see what they have now, so we can see where their pots and pans are going, where the Tupperware goes, and where they put their Keurig, Mixmaster and all of their other items,” says Boznos. Be prepared for the occasional odd request. These observations usually lead to creative solutions, like a water spout placed near the Keurig, so the homeowner isn’t walking across the kitchen with a cup full of water. Whether or not your new kitchen or bathroom is streamlined, it’s certainly designed with you in mind. A good designer’s job, after all, is to solve a problem. But creating a minimalized room may take a little compromise and clever engineering. First, designers must contend with the details that can’t be changed – like an inconvenient air duct or the ventilation space required for a built-in coffeemaker. Then, there are the enforced restrictions, like those stipulated by municipal building codes. Electronics may create other challenges, too. Gadgets like Lutron switches, undercabinet outlets and electrical heated toilet seats require additional electrical wiring, and thus a higher expense and longer timeline. Even traditional outlets may require some accommodation. “Anytime you’re going to have an electrical box in your cabinet, there’s probably going to be some kind of reduced depth in that cabinet, in order to get those to fit in,” says Boznos. Luckily, creative engineering can alleviate many common obstacles. Because many kitchen and bath designers work with semi-custom or fully custom cabinet manufacturers, there’s little need to worry about the one-size-fits-all cabinet. Typically, there’s flexibility when it comes to height, width, depth and other modest modifications. Insignia carries five cabinet brands, each of which allows some level of customization: Kemper, Monarch, Dura-Supreme, Grabill and Neff. Blue Ribbon carries Wellborn Forest, a semi-custom cabinet line, in addition to Bertch cabinetry, which is fully custom – even down to the paint color. Your newly streamlined kitchen may hold all of your equipment and then some, but how effectively will it work for the next owner of your home? It’s a serious question that may affect how much you customize your new kitchen. It’s tempting to give in to the skeptic and wonder what must be sacrificed to streamline your kitchen. Don’t give in to the skeptic. Lebar believes there’s little sacrifice required because of how effectively the streamlined kitchen utilizes space. Boznos and Wardlow believe the greatest sacrifice may be the extra investment that comes along with certain solutions. But when a homeowner is dedicated to cleaning up their kitchen and sustaining its new order, there’s little to deter them. This entry was posted on Tuesday, September 12th, 2017 at 11:59 am	and is filed under Home & Garden. You can follow any responses to this entry through the RSS 2.0 feed. Both comments and pings are currently closed.